Before knowing my father had dementia, I blamed his vexing behaviors on other things. Dad was elderly and tired. His hearing was awful (and had been for years). He’d become human cement, set in his ways. He resented, as his body weakened, his loss of independence. Dad’s fury, launched at me with the unnerving abruptness of a lightning strike when the storm is miles away, happened several times before my family recognized he had dementia. I recall how I felt when my father, the lion in winter, verbally assaulted me. What a cranky old fool! Such a stubborn jerk! And this too: how dare he sin against me? His son! His guest! Of course, in the New Testament’s Greek, there wasn’t a reference to “sister” in the scripture. But we moderns, desiring to be modern, readily and rightly add “sister” in the interpretation. Women are equal opportunity sinners too, right? I mused this week, here and there, on and off, about Hagar. 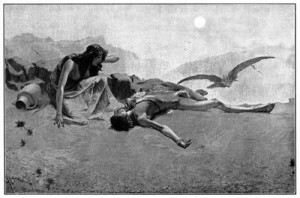 Though pulpit-less, I diligently read the Sunday lectionary “lessons” and so she entered my consciousness after a Tuesday pre-dawn encounter with her in the 21st chapter of Genesis. Hagar was a slave. Which meant she was worthless, but a price could be put on her body. Hagar was not Jewish. While I could’ve written the more positive “Hagar was Egyptian,” I suspect Sarah—Hagar’s primary owner—viewed her handmaiden (nicer than slave) in negative terms. Sarah could likely list many Hagar-was-nots. Hagar was not a nice person. Hagar was not a very good mother. Hagar was not a believer in the one true God. Hagar was not a good influence on Abraham. 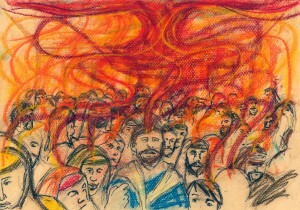 On Pentecost, God’s spirit unsettled Jesus’ disciples. A wind. The fire. Those flames. Many voices. Simple folk that likely couldn’t read or write more than their own name and snippets from the Torah began to speak—with clarity and authority—“foreign” languages. Since Pentecost—oft called the birth of the Christian community—we of the Christian tribe have institutionalized unsettledness. On Pentecost Sunday, the preacher strides toward the pulpit. It is, right now, the scariest place in her visible and invisible world. Before delivering the “good news,” she will read the scripture. The congregation already knows what she’s chosen because it’s listed in the worship bulletin, the web page, the twice-monthly newsletter and currently displayed on the projection screen.